Make membership a strategic part of your business. There’s more to a membership site than great content. You need to think strategically in order to create strong engagement around your expertise and your brand. Selecting the right platform is an essential part of the process. That’s why I strongly recommend AccessAlly. 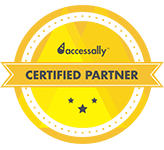 As an AccessAlly Certified Partner, I’ve been fully trained in every aspect of the AccessAlly, AccessAlly Pro, and PopupAlly products. More importantly, my team and I specialise in designing and building membership sites that are as organised and engaging as they are beautiful. Protecting your valuable content and reserving it for your members. Integrating with your CRM for ongoing member interaction. Making it easy for members to navigate and use. Loading quickly and including gamification to enhance engagement. Generating passive income and including opportunities for additional sales. Reflecting your existing brand with ease and professionalism. Growing with your business and your audience. Allowing you to make simple updates on your own. AccessAlly brings you a beautiful and profitable way to share your wisdom with the world. We bring you the expertise to make it easy. When I met Julie, I was transitioning into a new system with Access Ally and wondering if I had made the right decision or not. It's an investment to change how you do everything! My developer was great for general website work, but knew nothing about Access Ally integrating with Ontraport. It had taken him a month to get what I THOUGHT was needed to release my courses only to find out that it was set up all wrong, it didn't work, and there was no integration for people to access the classes they had paid for. So I had a lot of ground to make up and I was terrified we couldn't get it all done in time. My business has lots of low-ticket offers, so Julie's services were a big stretch for me financially. But she had come highly recommended. I knew I was going to be able to sleep at night knowing the work was done right the first time and I was willing to pay for a system that would last. And wow! Am I happy I did. As a result of working with Julie, not only were we able to get our new portal up and running in time but she showed us so many new ways to automate all our systems that continue to save us time and energy. My support person is so excited, because she has barely anything to do for technical support and can focus her time engaging with clients in new ways. Which makes our clients happy too. Julie brought even more value than I could have imagined for what I asked her to do for us. We now have a portal with six classes and one membership, each of them allowing students to track their progress. And because they are all in one pretty dashboard, students can see everything that we have to offer in a glance and they can buy the next class in the series when they are ready. We are seeing increased organic sales with this new dashboard. One of my favorite things about working with Julie is that she also gave us a series of videos to show our support team how to manage the courses we have now and create future courses too. She's done all the foundational work which will help us upload new materials fast when we are ready to release our next course. I can't speak highly enough about Julie and her team. She's one of the best people I've ever hired when it comes to creating a project roadmap with milestones and staying on track no matter what. We had some pretty demanding timelines and she was also clear in her communication about what would be done, when. She delivered early just to make sure we had time to test and see if it worked the way we wanted. Julie somehow made it easy to relax even though we were quickly coming up on two launches. And Julie is very detail oriented. If your website is stressing you out, she's amazing at sorting out what's important and making sure all the i's are dotted and the t's are crossed. She's really good at thinking through scenarios for how people may use your site you may not have thought about yourself. I wish I could hire Julie to run my whole life ;). I felt so supported and taken care of. Thanks Julie! We specialise in converting your program, content, or course into a profitable membership site your audience will love. We’ll review your existing brand and select elements to use for your membership site, creating a cohesive feeling and image that builds on your current brand. We’ll plan a content structure based on your goals for your site, allowing you to scale as your audience grows. We’ll look for opportunities for additional sales, and consider how members will engage with your offerings over time. Then we’ll ensure your content is organised and easy to navigate, providing the best possible experience for your members. Using the content structure as our guide, we’ll create custom page layouts for your membership and content pages using elements cohesive to your existing brand. Already have a web-savvy designer you love? We’re happy to work collaboratively. We will translate the vision of your membership site into a working website, including any special functionality you need - such as progress objectives, a credit system, or forums. Your membership site will be mobile responsive, secure, and fully tested before launch day. Share your wisdom with the world using AccessAlly. Reach a wider audience, leverage your time and energy, and let your brilliance shine beautifully with an engaging membership site custom-built for you and your business. “I had been searching for a web solution that would allow me to offer more content to my VIP Members, but it had to integrate with Ontraport. I’m so grateful I found Julie Waterhouse - who’s certified with both Ontraport and AccessAlly. She’s just the techie expert I needed to make my vision a reality. Julie “got" what I wanted to accomplish, offering support to guide me along the way. Her project management and communication skills are exceptional, going above and beyond to deliver on her promises every step of the way. I’m so glad I found her! If you haven’t hired Julie yet - do it today.